Timeless and sophisticated with a hint of personality, dog&boy scarves are for the seeker who appreciates refinement and uniqueness every day, where luxury is defined as a state of confidence and elegance. The enduring effortlessness of dog&boy designs make women feel stylish and feminine, adding a statement piece or final edit to any outfit, complementing her everyday wardrobe, no matter the journey. In color pallets of fresh delights for spring or moody winter hues, dog&boy is not governed by the latest trends, and will surprise and delight season after season with original designs in refined fabrics. With a stunning combination of rich and muted winter colors, our FW'19 collection will be launched exclusively at NY NOW. Australian accessories brand dog&boy has announced the launch of their FW19 collection exclusive at NY Now. The collection reflects the designer’s love of storytelling through design. Inspired by the beauty in the everyday and brought to life through thoughtful design. 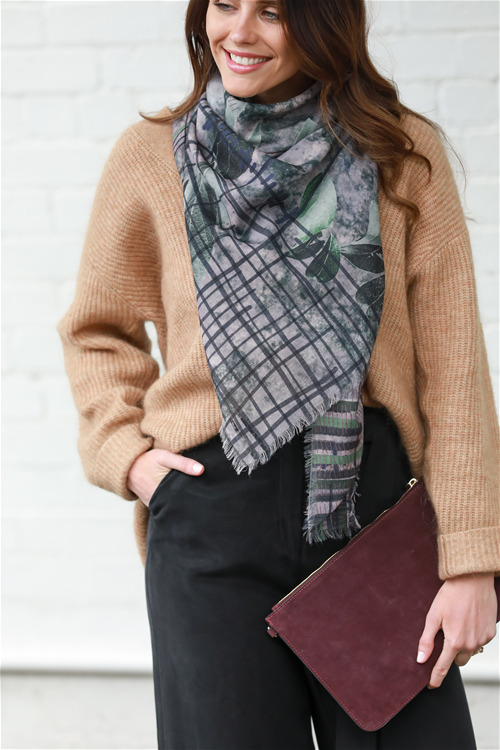 The timeless selection of scarves go beyond the contemporary fashion scene, offering the wearer a range of exclusive prints that are stylish and sophisticated with a hint of personality. Founded in 2015, the story of dog&boy started from a passing comment from a friend that Sonya should design her own scarves after Sonya complained about not being able to satiate her lifelong scarf obsession. The idea stuck and the journey of dog&boy began. After leaving the corporate world in the pursuit of her new dream, Sonya quickly gained a loyal following for her unique and beautiful designs. Now stocked in over 65 independent boutique and lifestyle stores in Australia, New Zealand, Indonesia, and China, dog&boy is delighted launch the new collection exclusively at NY Now this season. However, the journey to the success was not without heartache. Shortly after the launch of dog&boy, Sonya was confronted with her mother’s diagnosis and passing from brain cancer within the same month. To this day, Sonya continues to honour her mother by weaving her mother’s sketches into many of her designs and donating a percentage of the profits of dog&boy towards the Cure Brain Cancer Foundation for research and support for others facing this devastating disease. From the rich colors of ‘Simplicity’ print, or the chic layered design in ‘Smoke & Mirrors’ print, the carefully selected natural soft fabric and choice of muted tones of pinks, olive green, blue and lilac, combined with intricate etching and bold patterns reflect a quiet confidence in the way designer Sonya Michele plans her collections. “I design, not with the intention of keeping up with fast fashion trends, but to create something beautiful and timeless. I want people to feel nostalgic and inspired by my pieces - as a designer that is the ultimate goal” said Sonya of her FW19 collection. Each dog&boy scarf also comes with a carefully selected quote to capture the essence of each piece. The quotes allow the wearer to think about what that concept means to them personally – making the pieces not only a reflection of the designer’s journey, but also the journey the new owner is about to embark on. With a strong focus on ethical sourcing, manufacturing and production, all dog&boy designs are printed on premium grade natural fibers, such as merino wool, silk and cotton, and digitally printed using eco-friendly reactive dyes to minimise and reduce the brand’s impact on the environment. 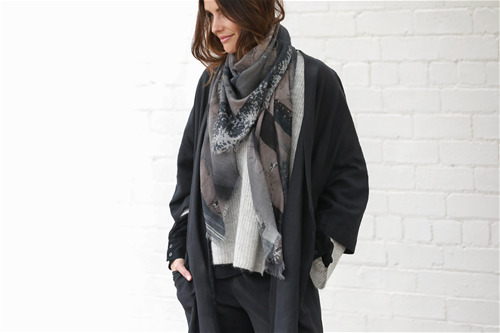 Available in two sizes, dog&boy scarves make women feel stylish and feminine, adding a statement piece or final edit to any outfit, and complementing everyday wardrobes, no matter the journey. Australian accessories brand dog&boy has provided the next generation of designers with the opportunity to feature in the latest AW19 collection - giving them exclusive insight into the fashion industry. Teaming up with The School of Fashion and Textiles at RMIT University, Melbourne, for the 6-week project, dog&boy’s founder and principal designer Sonya Michele mentored a group of 16 students, helping them to bridge the gap between fashion and business, by putting theory into practice. Run like a real commercial project, the students were presented with a brief and deadline to create 3 designs that not only worked harmoniously together to tell a story, but would also be a product that dog&boy’s customers would fall in love with. Following the initial briefing Sonya provided the students with feedback on their preliminary concept, allowing them to further develop their designs – to reflect dog&boy’s aesthetic. The winning student, Samantha Seary’s three designs – Looking Back, Ripple and Souvenir – responded to the brief perfectly. Themed around her reminiscent childhood holidays in rural Victoria, the designs incorporate colours and patterns that create the sense of relaxation that she experienced during these memorable trips. dog&boy’s AW19 collection featuring Sam’s signed designs will launch into the international market at the NY NOW tradeshow (3 – 6 February), to Australian retailers at Life Instyle Sydney (21 – 24 February) and will be available online direct to customers from March 2019. Fabric: Australian merino wool, the finest of fibres next to cashmere. yourself as often as you can. The intricacies of nature are simple yet complicated. Notice them, admire the beauty around you.